Dr. Michael Grunwald ASH 2018 Risk Assessment and Treatment Myelofibrosis Patients at Community Oncology Practices in the U.S.
David Wallace’s experience after being diagnosed with a type of blood cancer led him to want to raise awareness and help others. He created PV Reporter, a website that provides easy access to information on Myeloproliferative Neoplasms (MPNs), a closely related group of blood cancers, as well as the MPN Cancer Connection (MPN-CC). In May of 2009, Wallace received his blood cancer diagnosis. “I found out early on that if I didn’t become a patient advocate that I was going to be eaten up by the medical system,” Wallace said. After his diagnosis, he had trouble getting the doctor appointments he needed and ran into problems with some doctors he met who did not know much about the type of blood cancer he had. Specifically he had been diagnosed with Polycythemia Vera (PV), one of the blood cancers found under the MPN umbrella, Wallace said. He went through various doctors to get the proper treatment and information he needed for dealing with the disease and in 2013 decided to start the PV Reporter to help others who may be going through a similar situation. Two years after starting PV Reporter, with the help of many others, he created MPN-CC, a non-profit organization that further works to raise awareness and assist those living with the blood cancers found under the MPN umbrella, Wallace said. Wallace informed us the three main types of MPNs are PV, Essential Thrombocythemia (ET) and Myelofibrosis (MF). Wallace grew up in the Charlotte area and has been a Mint Hill resident for several years. He is doing well today and is currently in remission. He said he is glad to be able to help others with the work he does with PV Reporter and MPN-CC. “I still go to the doctor every three months for check-ups, but I’m still able to do 90 percent of what I did before I got PV,” Wallace said. His goals for PV Reporter and MPN-CC are to raise awareness about the blood cancers and to help those affected by them. Currently he is working on a podcasts for the PV Reporter website, which may also later be added to the MPN-CC website as well. The article above was featured in the Mint Hill Times, July 11, 2018 – click here for the original coverage. I’m so glad to be a part of the tight knit MPN community we have. It’s really about “people helping people.” Essentially, I am a cog in the wheel, so many fellow patients have helped me out along the way and still do. Sometimes the feedback I receive from patients I help directly (by email or phone) is beyond heart-warming and makes all of this hard work worthwhile. One of my goals for 2018 was to get local coverage for MPN Awareness and my advocacy work tied in with MPN Cancer Connection, our non-profit 501(c)3 public charity. 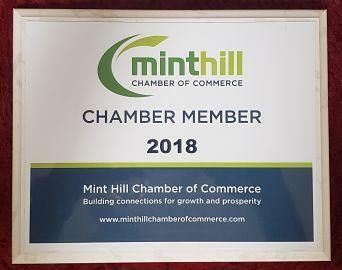 In order to do so, I decided to join the local Mint Hill Chamber of Commerce. While attending the first luncheon meeting, all new members were asked to get up and give a brief description of their organization. After talking about MPN-CC, I had several people come up and ask me about my work, a few mentioned a relative or friend with other types of blood cancer. So there is definitely interest in the community. I have asked patients (mainly in newsletters) to get out there and tell their story, so I figured it was time for me to do the same…..again, in the local community. The more folks that follow along this path, the more awareness we build for our “funky blood cancers.” If you would like to share your MPN story and help further the cause, please email me using the second form with the comment box, and we can discuss the details. Founder of PV Reporter, a resource for Myeloproliferative Neoplasm (MPN) patients and caregivers. After being diagnosed with Polycythemia Vera (PV) in 2009, I utilized social media to connect with "informed patients" and develop a better understanding of emerging treatment options. My philosophy on patient care is straight forward - "educating the patient is essential, so the patient can guide their physician to meet his or her needs." PV Reporter is a comprehensive resource hub giving visitors vital tools to become "empowered patients." Over the Counter Combo of Zyrtec and Zantac helping PV patients get relief from Itching! PV Reporter was created by David Wallace, an aspiring web designer, publisher, writer, reporter, patient advocate and chief bottle washer. I have been a PV patient since 2009. PV became a motivating factor to push myself to always be learning something new. Learning web design and becoming a patient advocate were some of my primary goals. Click on the image above for the New MPN Patient Guidelines! Very detailed, provided by NCCN. by Scott Sanders (guest author) A cancer diagnosis is devastating but it isn’t a death sentence (in most cases). Myeloproliferative Neoplasms, MPNs, are treatable and with […] The post MPN Cancer Survivor Self-Care Tips appeared first on MPN Cancer Connection. Nationwide Population-based survey in Denmark Objective: We sought to determine the prevalence and severity of anxiety and depression among patients with Philadelphia-negative myeloproliferative neoplasms (MPNs) and […] The post Anxiety and depression in Myeloproliferative Neoplasm patients appeared first on MPN Cancer Connection. Dr. Verstovsek on Benefit of Ruxolitinib Treatment in PV Srdan Verstovsek, MD, PhD, director of the Hanns A. Pielenz Clinical Research Center for Myeloproliferative Neoplasms at […] The post Benefit of Ruxolitinib Treatment in Polycythemia Vera by Dr. Verstovsek appeared first on MPN Cancer Connection. by David Wallace MPN Cancer Connection is very pleased to announce a new partnership with the PAN Foundation. Myeloproliferative Neoplasm (MPN) patients may be eligible for […] The post MPN Cancer Connection partners with PAN Foundation on Medication Assistance Programs for MPN Patients appeared first on MPN Cancer Connection. Follow PV Reporter on Pinterest. Click on the image above to get our mobile app from the App Store or Google Play. Are MPNs a Rare Disease? Are Myeloproliferative Neoplasms a Rare Disease?